Kuojung CHANG comes from a family with sculptor’s heritage, his grandfather sculpted historical landmark on mount Tai-Wu in Kinmen. He is a rare sculptor with both academic and practice excellence. Since age of 12, Kuojung started his apprenticeship under his father’s guidance and had become skillful by the age of 18. He went to Accademia di Belle Arti di Carrara, Italy, to obtain a master degree in sculpture. 8 large sculptures erected in Kinmen Sculpture Park are one of his famous creations. “Glorious time” Series Human body has been one of the most essential part of western sculpture history. Instead of noting the physical aesthetic. Zhang, Kuojong chose to focus on the graceful inside beauty of eastern women’s beauty. “Flower, Leaves and Fruits” Series Inspired by the gift from the nature. Flower and its fruits show the splendid moment of the plants and leaves are the full meanings of life’s journey. 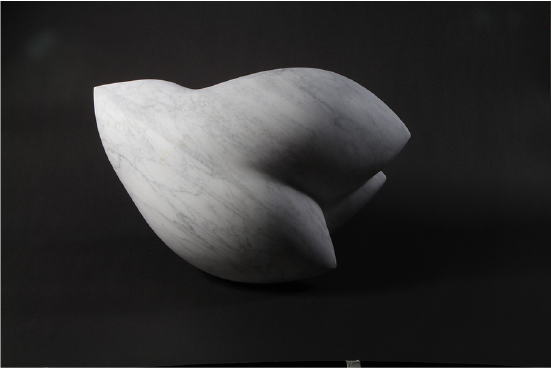 It may come in a whole, or partial, or even restructured; a rigid white marble becomes fluent. The abstracted creation has different tone from different viewing angle and it gives viewers an infinite room of imagination.